After throwing a bullpen session with no apparent issues or setbacks on Thursday afternoon, the Washington Nationals are confident (barring any discomfort over the weekend) that Stephen Strasburg will be able to return to the starting rotation on Sunday for a start against the Cleveland Indians. Strasburg threw 56 pitches in a simulated game on Tuesday, from which he disclosed that he felt no tightness in his oblique and was comfortable throughout the entire session. Following his May 31 start against the Atlanta Braves, in which he lasted only two innings before experiencing tightness in his oblique, Strasburg was sidelined and placed on the 15-day DL. The first-overall pick in the 2009 MLB Amateur Draft out of San Diego State was enjoying a solid season before being sidelined with the oblique injury, posting a 3-5 record and 2.54 ERA in 12 starts. 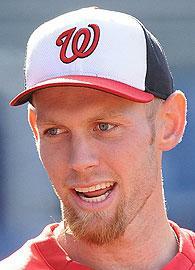 In addition, Strasburg boasted a 73/21 strikeout to walk ration in 74.1 innings of work, along with a 1.06 WHIP. If a return on Sunday comes to fruition, Strasburg will more than likely be placed on a pitch count, which should be held in effect for his first start or two (which is no surprise for the Nationals starter, who was infamously shut down late last season to preserve his arm).